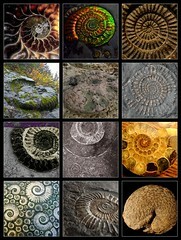 Thinking about fossils, I went looking on Flickr for pictures of trilobites, but I found instead all these gorgeous swirled images of ammonites. After I finish some trees, I have a fossil or two in my future. A set of fish bones. A trilobite. Definitely an ammonite.